“I have something I want to show you,” I said as I reached into my backpack. I placed photos I had taken from a year ago in front of him. He began looking through them and passing the photos to his colleagues sitting next to him. They knew the names of each player in the photos, and told me where they were now living. Most of them were still here. A few were living in the United States. I had remembered the time of day and where each photo was taken, but names and so forth had escaped me. The interesting thing to me was that the majority of particularly photogenic players had made it higher in the team’s minor league system. Maybe the same characteristics that drew me to snap their photos also drew the coaches to promote them higher up the baseball ladder. Even more interesting, perhaps, was how I had just stopped their meeting. This would have never happened in Chicago, this I was sure of. After they had finished looking at the photos, I told Cabreja that I wanted to do a multimedia story on the Cubs Academy. This is what I love about the Dominican Republic. They treat baseball like religion but seem to always have fun doing it. There is a certain dichotomy that is harder to find in the United States. 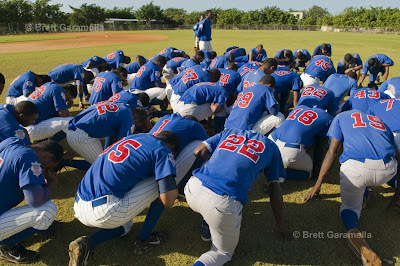 After kneeling down to say a team prayer, someone volunteers to tell a dirty joke to the rest of the team. Everyone seems like they are in a good mood. 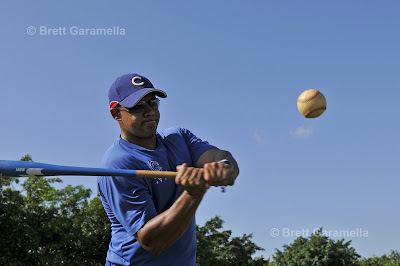 This is the Chicago Cubs Academy, one of about a dozen major league baseball academies located in the Dominican resort town of Boca Chica, but difficult to find if you’re not in the know. Each academy has about 60 to 70 Dominican prospects who have signed with a major league team. They are usually paid about $20,000 to $100,000 to sign. Any player that signs for more than six figures is sent directly to United States for training. There are a few Cuban and Venezuelan players as well who are invited to tryout before being signed. 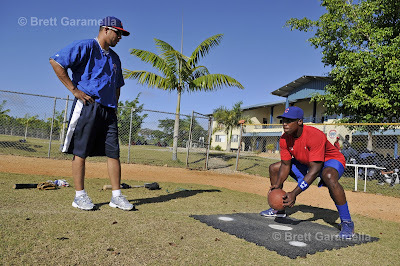 When I had visited the Cubs Academy a year ago, I met Oneri Fleita, the Cubs VP of Player Personnel. Fleita was tall, friendly, and bilingual; he fit in. When I emailed him last July requesting an interview with Alfonso Soriano, Fleita put me in touch with Jason Carr, who was in charge of media relations. Carr responded to my email, “Due to the high demand for his time, we can’t guarantee a one-on-one with Soriano. With regards to photos, we’d be happy to send you action shots of Alfonso taken this season.” I’m a journalist, not a Soriano fan, I thought to myself at the time. I’ll just have to find him in the D.R. My wish was granted moments after I had interrupted Cabreja and the other coaches. I walked into the team’s weight room, where Soriano was lifting with teammate Aramis Ramírez. No one else was in the gym. 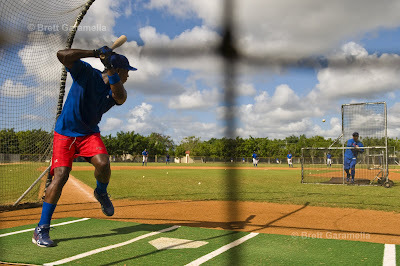 I introduced myself, and took photos of them doing agility drills in the outfield before fielding drills and batting practice with the rest of the Cubs prospects. They seemed like nice guys who were happy to be playing in their own country. When I asked Ramírez how he liked living in Chicago, he said, “I don’t live in Chicago, I just play there.” I couldn’t blame him for spending his winters playing baseball in 85-degree weather. A couple days later I was walking alone down the dirt road that lead toward the Cubs Academy when a white SUV with tinted windows stopped next to me. The door opened. It was Soriano. “Get in,” he said. So what happened after you got in his car?